Happy Thanksgiving! And we'll throw our hat in the ring for this watercolor, of course. 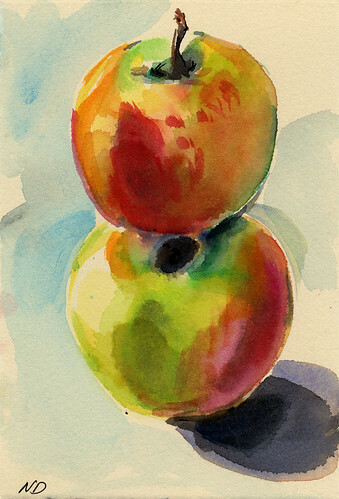 I especially like the red layer on the top apple, nice color work. Greedy, not yet... developing an addiction, maybe... adding my name to PP#16, you bet. Okay, I'll roll the dice-- odds or evens. And it's a five. Odds it is. Fleas, apples seem to be lucky for you. You should give that some thought. Just beautiful. I'd love to have it to display. Sorry Sequana, this one is in the mail to Fleasgang. But if you are interested in another feel free to comment. hey thanks for joining in aedm while you were on the nablopomo run! i enjoyed seeing your postcards (this one is gorgeous!) and i agree about the experimenting bit. it's good to let go.